The country is, indeed a promised land, and the some main Treks described in this website provide many opportunities to capture that vision in all its glory. ABC Trek is one of the most popular short to medium length treks in Nepal. On the way to ABC trek You will enjoy every single minute of these magnificent vistas which also include gorgeous forests of red and pink rhododendron and Passing through Gurung villages, lush forests and shrubs. When you reach Base Camp you will feel like you are in heaven surrounded by the inspiring panorama of sparkling snow covered mountains. We can assure you that each and every moment you spend with us will be a memorable one. Altitude is rarely a problem on this trek though there are plenty of close-up mountain views. The trek itself is not particularly strenuous. Though being in good shape will of course help. The Annapurna Base Camp trek offers a great blend of scenery over a relatively easy trail leading to spectacular scenery. Join us for your once in a lifetime trekking experience to Annapurna base camp (ABC), enjoying spectacular views of the Annapurna range with Mountain World Treks and our experienced team. Trekking to Annapurna Base Camp is not an easy thing with lots of uphill and downhill. Average fitness is required not to be in the pain make sure you have enough walking experience to enjoy the trek. Most of the days include 4-7 hours walking. Altitude can be the problem too so drinking lots of fluids and going slowly is important to avoid altitude sickness. Your safety is of our major concern. Your Trekking guide has the authority to amend or cancel any part of the itinerary if it is deemed necessary due to safety concerns. Since this adventure entails travelling in remote mountainous regions, we cannot guarantee that we will not deviate from it. The Guide will try to ensure that the trip runs according to plan, but please be prepared to be flexible if required. Day-03:Pokhara - Nayapul - Sewai by drive and trek to Chomrong. (2170m)2.30 hrs drive and 5-6 hours trek. 7Km 5-6 hours walking. Take drive to Sewai from Pokhara which takes about 2.30 hours and start trekking onwards to Chomrong Village. Quite flat walking path at the beginning but end with about 2 hours steeper steps towards Jhinu Danda and Chomrong. From Chhomrong the trail descends until Chhomrong Khola then trail begins a slow climb as we head up to Sinuwa than there is a clearing in the forest a little further on, from there the route goes very steeply down a bank of rock and then levels out, running through thickets of bamboo at the bottom of the gorge, keeping always on the west side of the river. After bamboo another hour to reach dovan for today’s overnight stop. (Over night at tea house on full board basis). Day-05:Trek to Deurali (3200m) 6.8 km 4-5 hours walking. We walk through the rain forest and cross the Barah temple where there is a small trail and a shrine. Continue track climbs to Himalaya hotel and another 1.5 hours reach Deurali at the campsite where you will overnight. (Over night at tea house on full board basis). 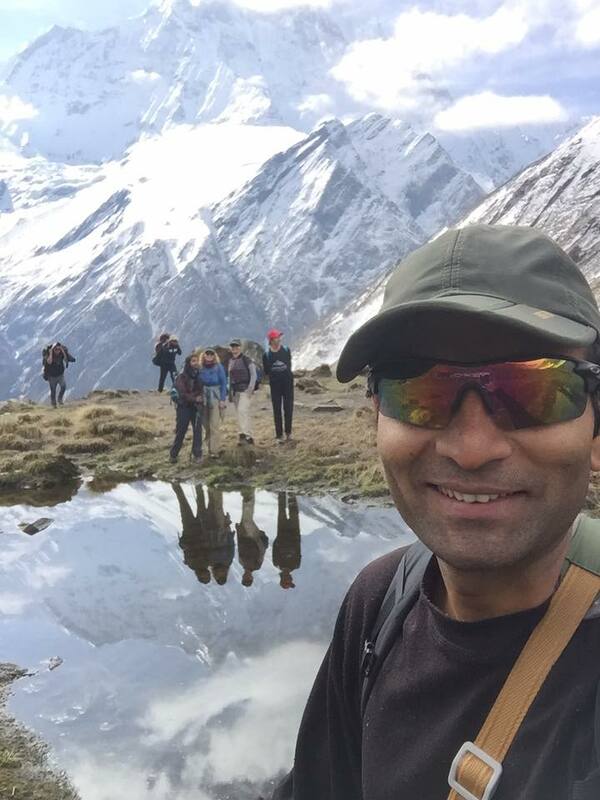 Day-06:Trek to Annapurna base Camp (4130m) 7 km, 4-5 hours. Trek along the Modi river side , less vegetation, less O2, beautiful valley and mountain views will be tough and wonderful day. 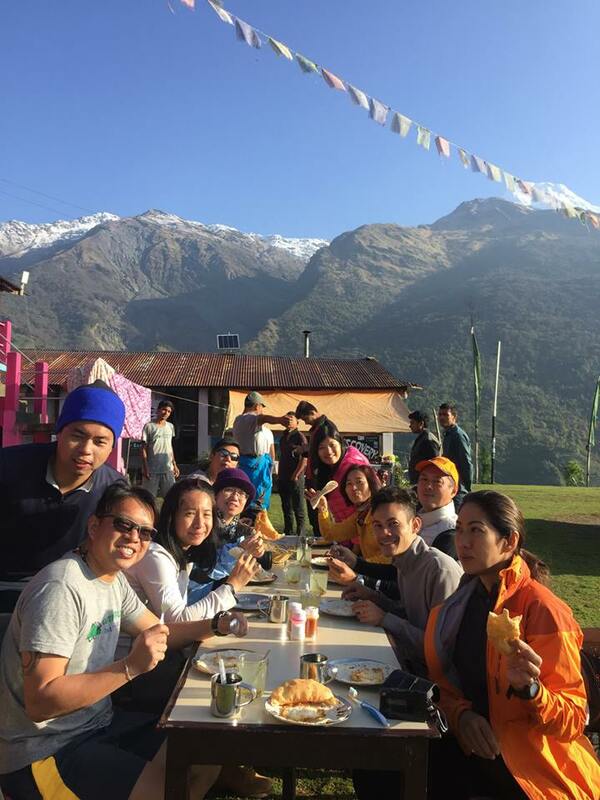 After you reach the Machhapuchhare Base Camp enjoy the hot drinks and hot food , get more energy to climbmg another approximately 2 hours to the Annapurna Base Camp. This area is called the Annapurna Sanctuary since it is totally surrounded by mountains. 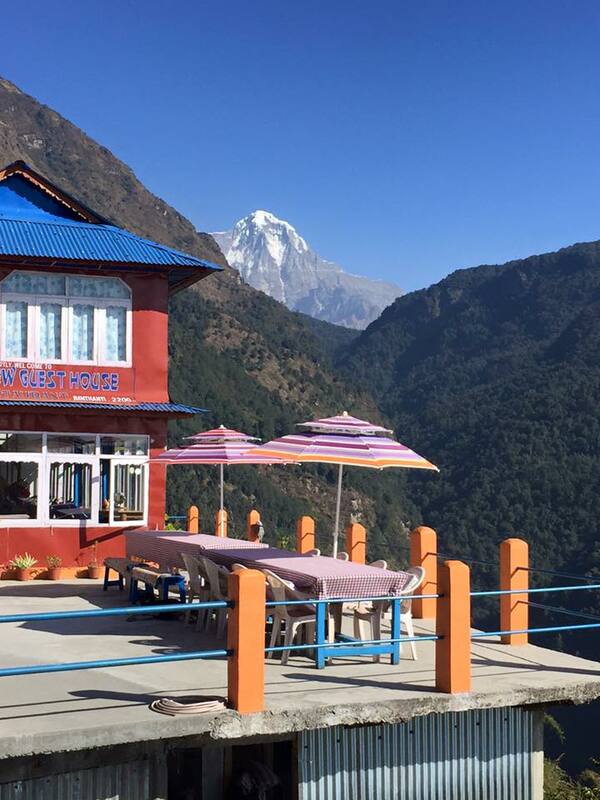 Now your dreams become true and you are at Annapurna Base camp, which offers spectacular views (Over night at tea house on full board basis). Day-07:Annapurna Base Camp to Bamboo ( 2300m) 13.2 km 5-6 hrs walking. Get up in the early morning and savor the magnificent sunrise over the Himalayas from ABC. After taking breakfast, we start descending from ABC to Bamboo back through MBC, Deurali, Dovan and finally reach Bamboo. Heading back down to the valley is much easier than climbing up. You will see the waterfalls that drop down from a high point to the rocks below. We pass through the forests with great views of Fishtail and Hiunchuli mountains. (Over night at tea house on full board basis). Day-08:Bamboo to Jhinu Dada (1760m) 7.8 km, 5-6 hrs walking. From Bamboo we make a steep ascent to the Kuldi Ghar and then to Sinuwa following the stone steps that leads to Lower Chhomrong. Then we ascend on the thousand stony steps taking us to Upper Chhomrong. From Chhomrong we descend to Jhinu Danda. We today get opportunity to enjoy hot springs lying just a 20-min walk from Jhinu Danda. (Over night at tea house on full board basis). Day-09:Jhinu Dada to Naya Pool (1070m) 10.8 km 6 hrs walking & drive to Pokhara. Trek from Jhinu Danda to New bridge and then to Kyumi village. After lunch, we trek to Syauli bazaar and then down to Birethanti. After about an hour trek from Birethanti, and we arrive at Naya Pul. The trek ends at Naya Pul. You will be picked you up at Nayapul and approx one hour drive takes you to Pokhara. We check in to our hotel late afternoon. Rest of the day free to wonder around. Overnight at the hotel in Pokhara BL plan. Day-10:Drive or fly back to Kathmandu. Upon arrival in Kathmandu, you will be transferred to your hotel. You can spend the evening leisurely, perhaps catch up on some last minute shopping or if you prefer you may celebrate dinner together with our trekking guide. Overnight at the hotel BB plan. We will Transfer you to International airport for final departure to your on wards destination. Personal expenses such as snacks, gear, drinks, Hot shower, wifi, laundry, phone calls, etc. 2. Chitwan jungle safari tour. We will provide accommodations in Kathmandu and Pokhara on your choice. 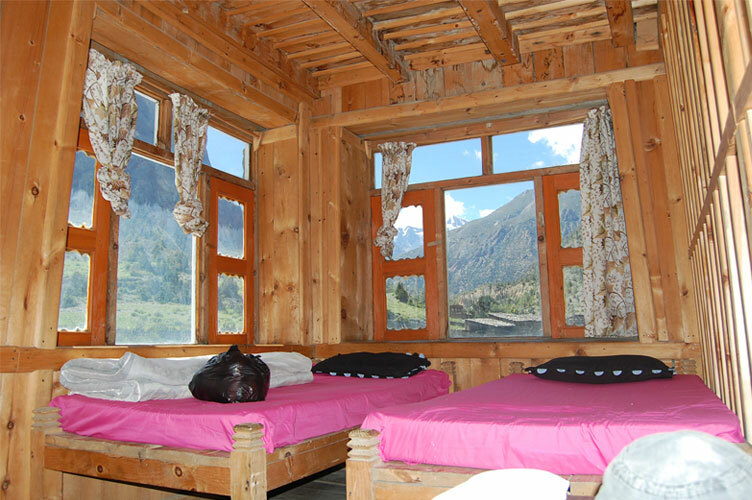 All the accommodation in the city and trekking will provided on twin sharing basis. Single supplement will be served on request and will cost extra. 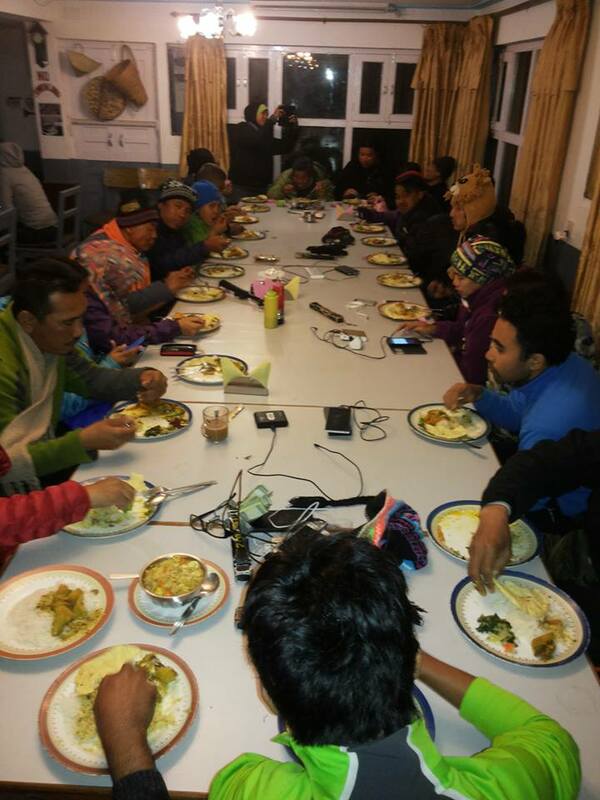 During Annapurnn Base Camp Trek, we can enjoy Nepalese food called ‘Dal Bhat’ as well the more common international cuisine (Tibetan, Continental, Italian, Indian, etc.). Most of the trekkers love the food on the trek. Breakfast, Lunch and dinner will be served during trekking, only breakfast include at Kathmandu Hotel. Autumn (Sept to Nov) and Spring (March to May) are the best seasons for the ABC Trek. The weather is sunny and warm with outstanding views. If you wish to avoid crowds and enjoy some alone time with nature then taking this trip during winter (Dec, Jan, Feb) could also be an another great option. However, the temperature during winter could be harsh for most guests. Trekking in the Summer or Monsoon seasons (June to Aug) will be affected by rain but the Summer trek could be a boon for a keen botanist. You are advised to consider the following equipment as essentials while packing. Please use this link as a guideline. Adjustments to the list can be managed according to our requirements, interests, duration of trip, and season of trip. We can find variety of these gears to hire or buy in Kathmandu. Majority of the gears which are in sale in Kathmandu are locally manufactured (hence a lot cheaper) and can find very high quality branded gears too in some famous stores in Kathmandu. Please make a selection How difficult is the trekking to Annapurna Base Camp? How fit do I need to be to go trekking to base camp of Annapurna? Can my children go on the ABC trek? What if I am a solo traveler? Is there a supplemental for singles? 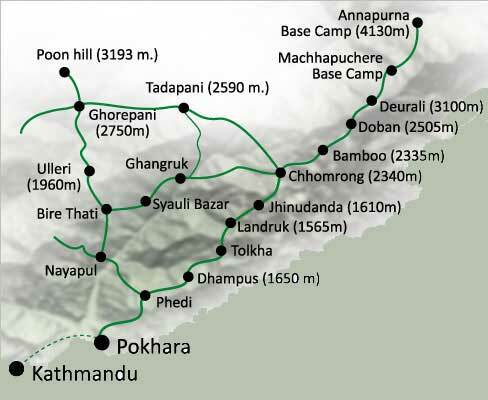 When should I go to Annapurna Base Camp​? What Kind of Gear do I need? Are there any ATM's on the Trekking route? Do I need to purchase my own travel insurance for ABCTrek? Will I get altitude sickness on the Trek? Will I have access to the internet? Can I charge my camera batteries on the trek? Will my mobile phone work on this Trek? What is the accommodation like? What happens if I get sick or get hurt while trekking? Who are the guides? Will I have to carry all of my own stuff on the Trek? Is the water and food safe on the Trek? No ropes needed and no ice picks needed. There is no vertical climbing involved. The trial is rough, Most of the trek involves long paths that go up and then down. People with weak ankles should take caution. Depending on the time of year you go there can also be snow and ice in the trails. Use caution or seek the expertise of our guide. A Average level of fitness is required. For trekking to Annapurna Base Camp​ in Nepal you'll need to consider the amount of days you'll be out trekking. Most days include 4-7 hours of slow hiking. Altitude is Not the biggest problem for this trek but there are alots of up and down with many stone steps. Many people from all walks of life, ages and fitness levels have trekked to Annapurna Base Camp​ and it is one of the popular trek in Nepal. Yes your Children can do it but make sure they have enough walking experience. No problem. Many of our customers are traveling solo. It may also be an option to join a small group or another solo traveler, let us know if this interest you. Yes, there is a supplemental cost if you are traveling alone, please Contact us to find out more. October to November is the start of the dry season and is the most popular time to visit Nepal as the monsoon has recently finished, leaving a green and lush countryside, fresh and clean air, and clear views of the Himalayan. From December to February the temperature is very cold but visibility is still good. With fewer tourists on the trails, this can be the preferred time to visit. However, the cold can make high altitude treks more strenuous than normal. Some treks will be closed due to snow. March to May is the second most popular time to visit. The weather is warmer and the visibility is still good, though not as crystal clear as between October to November. Nepal's flowers, however, come alive at this time of year. June to September is the monsoon season. While you can still trek during this time, the options are limited due to the rains and heat. Essential Items: -Warm Jacket -Waterproof jacket or poncho -Mid-weight fleece or sweater -2-3 Hiking shirts -1-2 pair Hiking pants -2-3 Non-hiking shirts -1 Long-sleeve shirt -1-2 Pairs non-hiking pants, shorts or skirts -2-3 Pairs warm socks -Warm hat -Sun hat -Long underwear (for high altitude) -Gloves (for high altitude) -Towel (preferably quick dry) -Day pack -Hiking shoes -Sandals -Sunglasses -Water bladder or bottle -Headlamp or flashlight -Sun screen -Lip balm -Personal medications -Camera Non-Essential Items: -Sleeping bag (can rent in Kathmandu) -Trekking poles (can buy or rent in Kathmandu) -Rain pants For more information Contact us. No. Only at Pokhara before/after Trek. Yes. Most trips run smoothly, but once in awhile something unexpected can happen, that’s why we highly recommend and to join one of our trips you must have travel insurance. Please see our travel insurance section for more information. 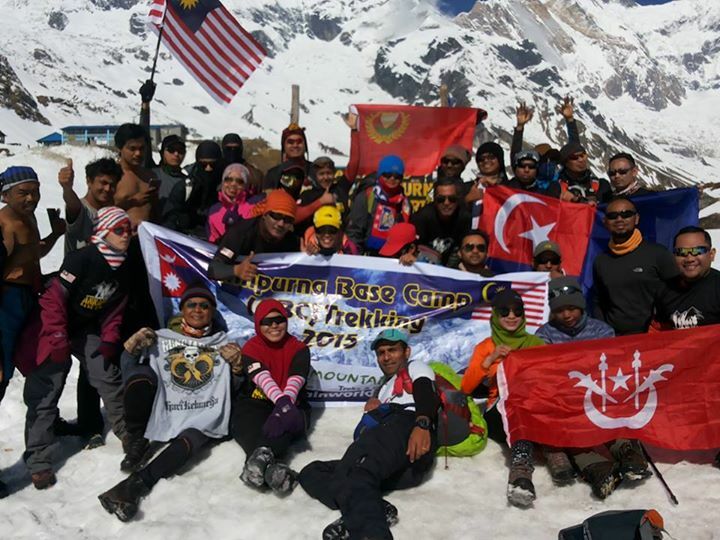 Annapurna Base Camp​Trek doesnt go higher than 4100m. and It is not possible affected by the altitude very much but some people might fell altitude symptoms It is usually above 3000 meters when people start to feel symptoms. Please see our page on altitude sickness for detailed information. Yes some of the place you will be able to use Internet if there in not any technical probem. eg; Ghorepani and Ghandruk. Cell phones work at most of the places on ABC Trek, depending on your mobile provider. There are also phone services almost everywhere we go if you need to reach home. We can tailor the accommodation to meet your requests. While in Kathmandu and Pokhara we generally stay in very nice 3-4 star hotels. During the treks, we will be staying in local guesthouses along the trail. The guesthouses vary, but overall are clean, charming and meet all of your needs. Basically our guide will sort out the things what to do. If it is not too bad you may go down by walking, however in the event of an emergency there usually is access to a telephone line or satellite phone for an evacuation via helicopter. This is another reason to be sure you are covered with adequate travel insurance! No, unless you request to. Our porters will carry up to 12kgs of weight for each trekker. All you need to carry are your essential items for the day. The porter fee is included in the price of your trip. We plan for 1 porter for 2 trekkers in accordance to the guidelines set out by the International Porter Protection Group. If you would like more weight to be carried, please let us know. In general 12kg is more than sufficient.